Baby Randy, this adorable Cushy Kids plush black bear, is a sweet little ball of fur you're going to want to take with you everywhere. Good thing is, the elastic loop on his head makes that super easy! With soft black fur and brown accents, Baby Randy plush black bears not only make wonderful gifts, but they are also perfect as ornaments, package tie-ons, and birthday bag favors. This sweet little stuffed black bear is part of the awesome take-along-size Handfuls collection. Get ready to fall in love with the adorable look on the face of this sweetly cuddly black bear from the Americana Bears collection. Sullivan is an adorable plush black bear is super cuddly with soft black fur, brown accents, and an understuffed body. 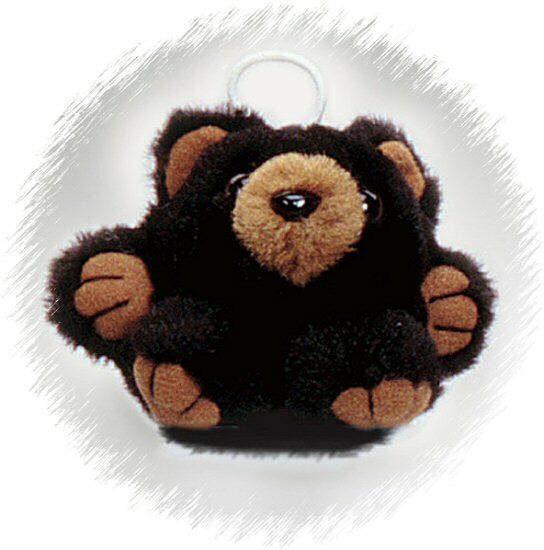 This adorable little black bear plush keychain has soft black fur, brown accents, and a sweet, smiling face. No need to fear this cute little Cushy Kid plush tiger kitten... with striped orange fur and white accents, Baby Timmy is a purrrr-fect pet.